DO YOU HAVE A PLANT QUESTION YOU WOULD LIKE ANSWERED? WHAT'S WRONG? WHO'S EATING THIS? I.D. PLEASE? QUESTIONS ASKED IN APRIL, MAY, AND JUNE WILL MOST-LIKELY TAKE A WHILE TO GET A RESPONSE, THANK YOU FOR UNDERSTANDING! QUESTIONS ASKED MAY BE FEATURED ON THIS PAGE. Viburnum Leaf Beetle (VLB) is native to Europe and Asia. Its introduction to North America occurred in Montreal in the late 1940's and the population has been slowly moving south since then. 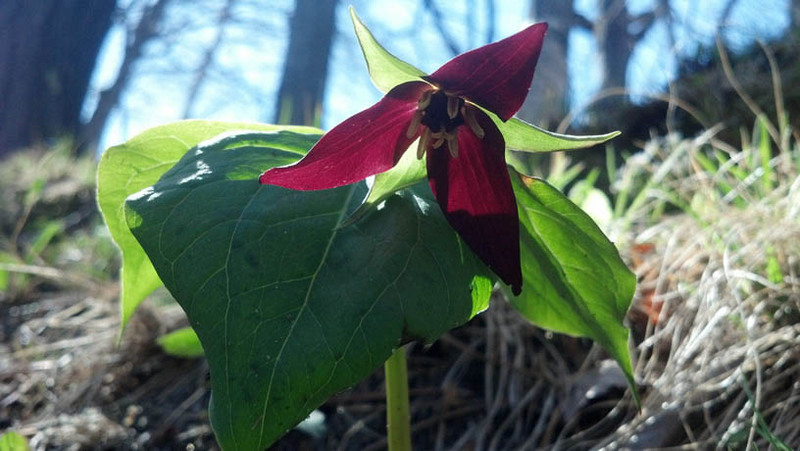 They have become well-established in our forests, so completely eliminating them isn't going to happen anytime soon, but a well-timed shearing will do wonders to reduce the populations on the plants in your landscape. In late summer to early fall, adult beetles chew rows of small craters in the tender stems from the past season's growth. In each crater they lay 6 or so eggs, then cover them with a cap made from chewed bark and excrement. Each adult beetle can lay up to 500 eggs, so the population can get out of control very quickly without proper management. The hatched larvae can quickly defoliate your plants and if this occurrs for a few seasons in a row, your Viburnums may perish. After the eggs are layed in October and before they hatch in May is the time to go on the offensive. Most egg-laying sites are located on the outer 6-8" of the plant. Shearing off this outer growth will go a long way in removing the majority of the of these thousands of leaf-chewing critters. Make sure you dispose of the clippings either by burning them or sending them to the landfill as composting them may not prevent the eggs from hatching. 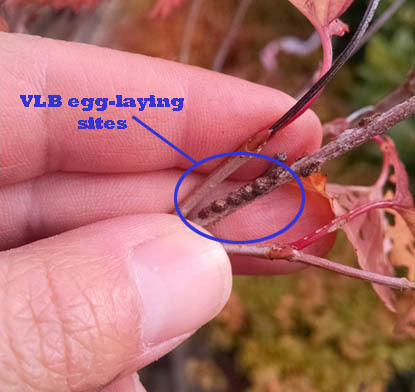 More VLB's will come back in the future, but if you save your Viburnum pruning for late fall or early spring, then you will have fewer insects and more leaves to show for it! We’ve all been hearing it for a couple of years now, and each season it becomes more and more apparent. There have been many shortages as a result of the recession -that we know- we have seen the effects. Last year business suddenly picked up; many growers did not anticipate that. To keep up with the sales momentum, many nurseries had to dip into the plants that were slated for this year’s inventory. As a result, supplies of everything are a bit tight this year. There is still plenty of construction on the books. All these projects will need plant material to wrap them up. Those who place their orders early will get the plants they need to fulfill their contractual obligations. Those who wait until the last minute will be subject to limited availabilities and will have to be flexible on receiving substitutions in order to have anything to put into the ground. This year, the old cliché “You snooze, you lose” will be more real than ever! 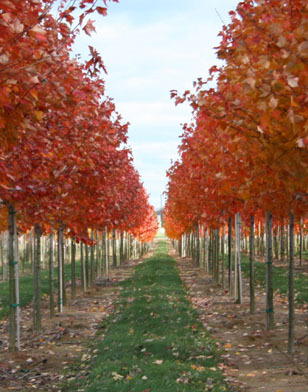 Why is fall the best time to plant a new tree? Most people think that the hardest season for a tree is the winter, but that’s not true. The tree is dormant in winter, so doesn’t care what’s going on around it. The most stressful time for a tree is the summer. Lack of water during summer dry spells is the biggest limiting factor in a plant’s growth. In order to battle the lack of water, a tree needs a good root system that can seek out water in the soil when the sky isn’t supplying it. Root growth occurs most in spring and fall with warm days and cool nights. By planting in the spring, you get one round of root growth before the tree has to deal with all the stresses of summer. When you plant in fall, you get two rounds of root growth before the heat of summer sets in. By planting in fall, you ensure that the root system is twice as strong as it would be if you had planted in spring. That’s why fall is the best time to plant. 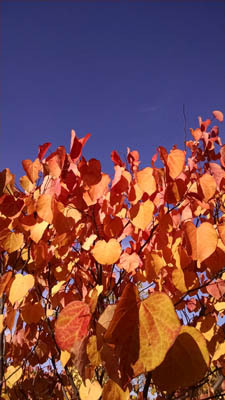 There is one catch though: availability of trees in fall is much lower than they are in spring. So fall is the best time to plant, but spring is the best time to get exactly what you want. 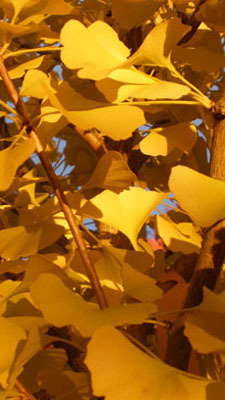 Fall planting requires flexibility in plant options. If you can be flexible on what you want, then you will have a healthier tree to show for it come next summer. Our sales staff would be happy to help you find other options that fit your wants and needs in a tree. Happy planting!! Ever wonder how cones form on an evergreen tree? Here's a little peek into the life cycle of a conifer cone. 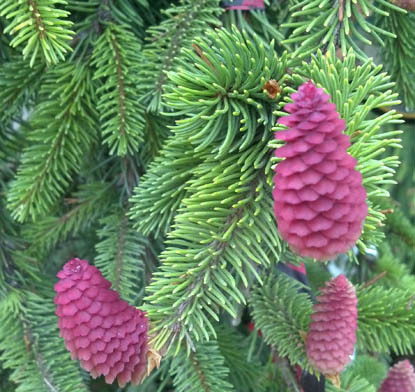 These photos are of the cones on Abies koreana 'Horstman's Silberlocke', but any needled evergreen tree will have similar structures. 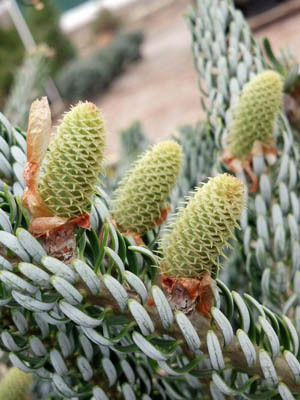 Each evergreen tree produces two different types of cones -male cones and female cones. The bottom portion of the tree produces male cones, while the upper portion of the plant produces female cones. This reduces the chances of the tree pollinating itself which isn't exactly bad, but if trees continually pollinate themselves, then genetic deficiencies will eventually become apparent. Male cones, like those pictured above, produce pollen and then fall of the tree shortly after. They typically are colored pink to red depending on the species. The pollen is blown by spring winds from these male cones on the lower portion of the tree to the upper portion of a neighboring tree. There the pollen settles on the sticky surfaces of the female cones like those pictured below. 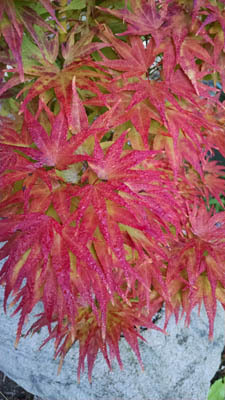 Female cones are typically green or pink to purple. 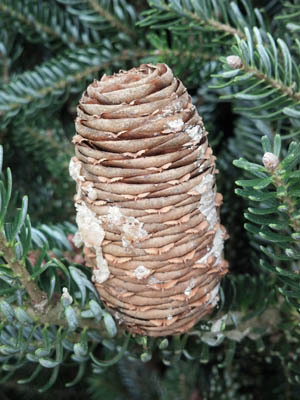 Each scale of the cone can produce two small, winged seeds (similar in appearance to a Maple samara, commonly called a "helicopter") if adequately pollinated. Once mature, in anywhere from 3 months to 3 years depending on the type of tree, the cone scales open up exposing the seeds to be blown away by the wind to settle on the ground and produce a new tree. 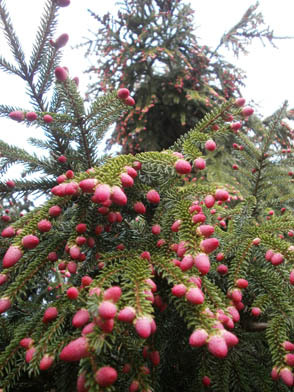 Generally, people don't think about evergreens as having flowers, but when these cone structures are in peak production in spring, they can be very colorful and eye-catching, even if only for a brief period of the growing season. 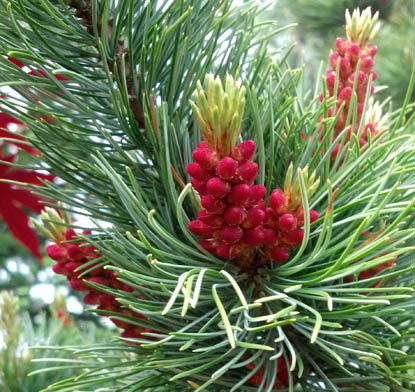 Many Pine trees have evolved to use fire to open the cones and expose the seeds. Our native Pitch Pine as well as Ponderosa Pine in the Western US are the two most well-known trees to take advantage of fire as a means of promoting reproduction. 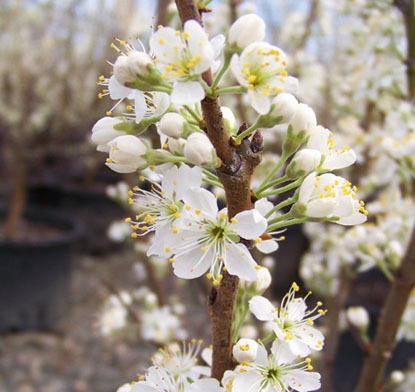 The talk around the industry lately has been about shortages - these shortages don't apply only to trees, but to B&B and container shrubs as well. There are a number of factors that are coming into play here. a) Depending on the tree species, it takes between 5 and 10 years to grow a typical landscape-sized tree of 2-3" caliper. In 2008 when the market crashed, growers were suddenly selling less trees out of their fields, which meant there was less available space to re-plant new trees. This trend continued for the next few years, meaning we are looking at about 3-5 years before 2-3" trees will be readily available again. b) There were many nurseries that failed during what is now being called The Great Recession. Fewer people growing plants means fewer plants available in the marketplace. With the near total demolition of a major portion of the Atlantic coastline, the demand for native plant material to re-vegetate and prevent further erosion has skyrocketed. Much of the last couple years crops of plants such as Ilex glabra (Inkberry), Prunus maritima (Beach Plum), Comptonia peregrina (Sweetfern) and Clethra alnifolia (Summersweet) to name a few have been earmarked for the rebuilding effort. More plants headed to the Jersey shore means fewer plants headed to our New England landscapes. The two biggest culprits here are Asian Longhorn Beetle and Emerald Ash Borer. While the first hasn't been detected in NH yet, it has caused significant damage at nurseries throughout the US reducing tree inventories. Emerald Ash Borer is here. Anyone who is still drawing Ashes into their designs in New England will have to come up with alternatives due to federal quarantines. The environment is constantly changing, and those changes often impact our plant crops. For the past few years we have had extraordinarily extreme fluctuations, particularly in relation to rainfall. It seems we are either in and unseasonable drought or absolutely saturated. These conditions have allowed for some diseases, which are normally minimal, to be compounded. 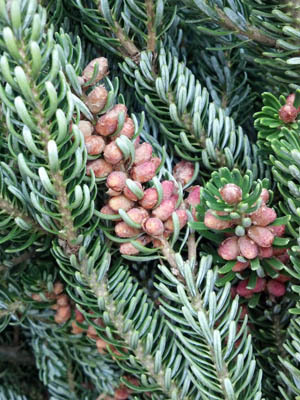 There are a few needle cast blights that are adversely effecting evergreens, especially two-needled pines (like Austrian Pine), and spruces (Norway and Blue Spruce). 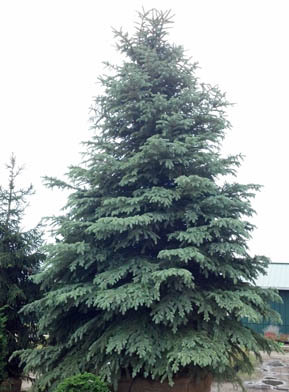 Some growers have had abundant crop failures thus reducing the availability of some of America's most popular evergreens. In the past, anyone could just put a plant in a design or on a list, and worry about finding it later when it comes time to install. These days it will be necessary to check with your supplier of the plant in question to make sure it will be available when you need it. Get us your lists as soon as you can, so we can secure material and make substitution recommendations if necessary. That's where the flexibility part comes into play. If the plant on your plan isn't available at the time of installation, a substitution will be required. Our sales staff are experts at the plants we sell, and are always happy to recommend alternatives that will enhance your design and perform well in your particular location. Make sure your clients are aware that these last minute substitutions will be more necessary in the following years than ever before. We would recommend being as vague as your clients will allow you to be when designing their landscape. Specify "Shade Tree TBD" on your design rather than "Red Sunset Maple 2-2.5 caliper". The best thing to do is to find out what your client doesn't like, and find an available tree in your price range that avoids these dislikes. Our sales staff is always here to help you, and together we can get through these difficult years. There is good news, though, and that is shortages often mean a greater demand. 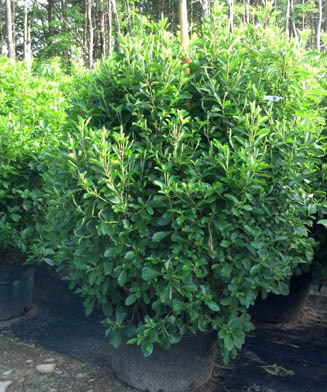 Demand for trees and shrubs are on the rise again ....FINALLY! 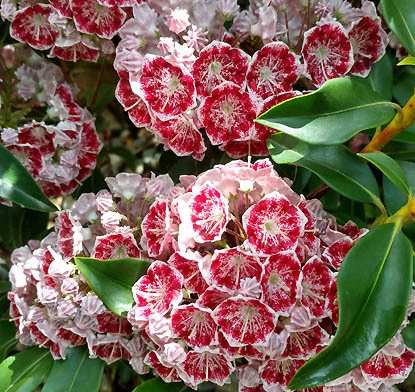 We have taken many calls recently regarding winter injury to broadleaf evergreens like Kalmia (Mountain Laurel) and Rhododendrons. Here are a few helpful hints to prevent this from happening to your plants. In winter, the jet stream pulls cold, dry, arctic air in from Canada. These winds come from the northwest. Make sure broadleaf evergreens are sheltered from these brutal winds. They dry out the leaves, and the frozen ground prevents the plants from replacing the water that has been lost. The sun is closest to the earth during our winter months. This means the sunlight we do receive in winter is more intense than in the summer months. Broadleaf evergreen leaves can be scorched by afternoon sun. In the perfect scenario, they would receive full morning sun, and afternoon shade ...which can only be provided by evergreens or buildings in winter. Keep in mind when planting these beautiful shrubs in summer that deciduous leaves will be gone in winter and what may be a shady spot during the growing season, may be in full blazing sun all winter. In most cases, as long as the stems have not dried out, the brown leaves will fall off and the plants will leaf out again. 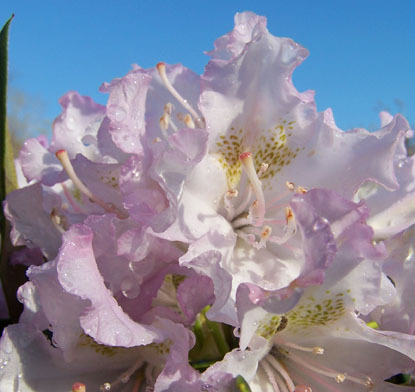 Rhododendrons can be completely defoliated by leaf scorch, but have their buds unaffected. Many times the large flower buds may dry up and fall off, but the smaller leaf buds remain in tact. Give your plants a little time to recover after a severe winter, and they may surprise you with their resiliency.